The Available Chemicals Directory is an online database of commercially available chemicals that can be searched by structure. Pricing and supplier information can be found for 3.2 million unique chemical compounds from over 800 suppliers, and is updated monthly. 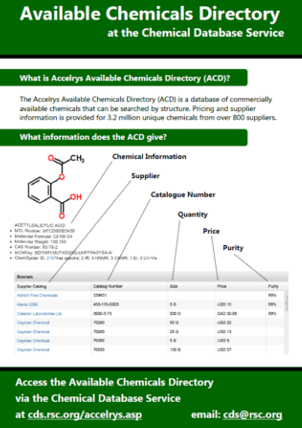 We are presently looking to integrate additional data from ChemSpider into the Accelrys Available Chemicals Directory web service on the Chemical Database Service. For example, I believe that it would be of value to know whether there was analytical data available in ChemSpider when searching for a particular chemical to purchase. Then, you would know that were spectra available to compare with should you purchase a sample and needed to compare data obtained on the purchased material. This work is in progress as shown below. This capability will be published to the live servers in the near future. Now a question for you…what else would you be interested to see shown on a record? A link to an MSDS sheet? What else??? As we roll out the National Chemical Database Service to the community we intend to incorporate those databases and services that we believe will offer the greatest value to the community and the highest return on investment to EPSRC. One of these services we believe is access to a service allowing for chemists to determine where to SOURCE a chemical – i.e. who are the vendors, what is the price, what is the contact information for the vendor(s)? We will serve this need in a couple of ways. One of these is by providing access to the Accelrys Available Chemicals Directory. We are presently testing the integration for release. Searching can of course be performed based on chemical name but we will provide both structure and substructure-based searching. We intend to provide access to a number of structure drawing tools for structure-based searching and therefore allow the user to choose their preferred drawing integration. Please feel free to suggest your favorite software package for drawing and we can consider integration moving forward. For now an EARLY view of the integration, and certainly work in progress, is shown in the movie here. You are currently browsing the archives for the Accelrys Web Service category.